One of my favorite pictures of Delaney reading. 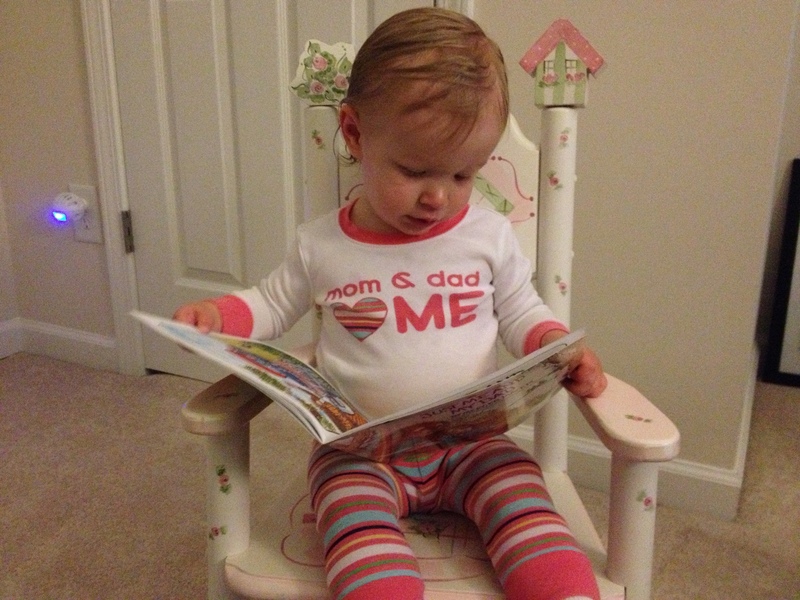 My daughter, D, is only 2 years old, but it is evident that she is a bookworm. How can we tell? She smuggles books into bed with her and sleeps with them! I can remember going into her room one morning because she was crying. After a quick investigation,I realized that she had slept on top of several books…7 to be exact! She was upset because she was uncomfortable. Where did she get this love of reading? Is it because her father loves books and reads all the time? Or is it because she has been exposed to books since she was too young to comprehend a story? I like to believe that it’s a combination of both. Eventually, D was ready for me to actually read the books with her. For about two months, her favorite book was Bears in Beds by Shirley Parenteau, and we read it every night. We read it so much that it was falling apart, and I almost knew it by heart. As much as my husband and I loved this book, we were ready to branch out into some other books. D enjoyed exploring books so much that we had to set a limit of 3 books a night or she probably would have wanted to read every book that she owned. To continue to encourage her love of books, we started keeping books in various locations. We had bath books that were waterproof, a book basket in the living room, and books in the car. We collected books from all types of places…book fairs, gift shops, fast food kid’s meals, family and friends gave them to her for birthday and Christmas presents, etc. At this point in time, D probably has a collection of 75-100 books…and it continues to grow. Now we just have to work on her sharing those books with her little sister.